POTENTIAL SURVEY PARTICIPANTS: Any person with an interest in children’s pain including researchers, research trainees, health professionals, administrators, policy makers, advocates, advocacy groups, educators, patients, parents, and caregivers. SOLUTIONS FOR KIDS IN PAIN (SKIP) need your input. Together we can make a difference for children in pain! Members of our Centre have been working closely with our friends at the Canadian Association of Paediatric Health Centres (CAPHC) and many others across Canada and beyond on a proposal to support a new network called “Solutions for Kids in Pain” (SKIP). Anyone with an interest in children’s pain management is asked to please take 5 minutes (maximum) to complete the following 12-question online survey. We’ll use your feedback to develop a network that will improve the way children’s pain is managed in Canada and beyond! We have prepared the following social media posts suitable for sharing. A social media image suitable for distribution is attached should you wish to make your own posts. CONSIDER CIRCULATING: Ewings Cancer Foundation of Canada (ECFC) has produced a documentary for wide distribution to educate non-oncology physicians, coaches, teachers and others on the importance of early detection of Ewing sarcoma and the impact of misdiagnosis. *Approx 47 minutes. May not be suitable for young viewers. Ewing sarcoma is difficult to identify and often gets misdiagnosed allowing the cancer to proliferate beyond treatable stages. If you read the personal stories on the ECFC website, there is recurring theme of misdiagnosis (e.g., sport or dance injury). Early detection is critical to avoiding metastasis, which is associated with a drop from 50-70% survival rate to an unacceptable 10-15% survival rate. ECFC has produced this 47 minute documentary for wide distribution to help educate on realities of Ewing sarcoma. Find below a letter of introduction from ECFC. What do you know about Ewing sarcoma? Most know very little and, shockingly, this can also be true about health professionals. It is a nondiscriminatory, aggressive cancer that primarily attacks the bones and soft tissue in younger people but can affect anyone at any age. Characteristically one of the most painful forms of cancer, tragically Ewing sarcoma is difficult to identify and often gets misdiagnosed allowing the cancer to proliferate beyond treatable stages. Currently, Ewing sarcoma is being treated successfully in 50-70% of cases identified using dated chemo regimes that are more than 35 years old. As you know, once it starts to spread, survival rates plummet to just 10-15%. We know old chemo regimes are damaging young, growing bodies and endangering the survivors with their lifelong health complications. This, in turn, becomes a burden on an already stretched healthcare system. There is no measure on the physical, emotional and financial tole of their families. Over the past 10 years, the ECFC have learned from patients this cancer is most often overlooked as it mimics growing pains, sports injuries or an inflammatory condition, delaying diagnosis with devastating consequences. We knew we had to do something about increasing awareness within the medical community. In 2017, the Ewings Cancer Foundation of Canada produced Make It Stop, the first and only professional feature length documentary (47 minutes) about Ewing sarcoma in the world to date. Shot and produced in Canada, it is the very first educational tool created for front line health care practitioners who may or may not be familiar with ES, including chiropractors, sports and massage therapists, radiology and the rheumatology communities to name a few. Featured in this film are Drs. Adam Shlien, David Malkin and Abha Gupta at SickKids, Toronto; Dr. Jason Berman in Dalhousie University, Halifax; and Dr. Poul Sorensen at the BC Cancer Care Centre, Vancouver. Please view this film here: https://www.youtube.com/watch?v=WYavC9GZpeg. We invite your comments and feedback once you do! We know that knowledge is power and with that power we can help stop this devastating cancer from taking the health and lives from society’s most vulnerable, the young. We ask you to include this documentary in your newsletters, industry publications, medical workshops, conferences, lectures, and/or symposiums and educational events for all registered rheumatologists across Canada. Early detection is vital and can make the difference between life and death. It is our hope we can work together to increase awareness for Ewing sarcoma especially within the Rheumatology Sector. With over 50 years of combined research experience, clinician-researchers Dr. William Foulkes and Dr. David Malkin, are pleased to introduce a new resource for patients and healthcare professionals interested in learning more about DICER1 syndrome. Until now, our research has contributed to allowing caregivers recognize the major features of the syndrome, counsel families about the mutation status in their families, and offer surveillance for certain conditions that can occur in those carrying DICER1 mutations. However, due to the rarity of DICER1 syndrome and related tumors, the study of DICER1 syndrome has been limited by the number of cases which occur. This Canadian research network will work to provide an international resource for the dissemination of the information that has been learned about DICER1 syndrome (available in English, French, and Spanish), a DICER1 sample database available for researchers at no cost, and a tool for broadening our reach for case and specimen collection. Please visit our website (www.dicer1syndrome.ca) or contact Evan Weber (evan.weber2@mail.mcgill.ca) for more information. Any Canadian who has ever been approached to participate in a clinical trial and either declined, did not qualify or participated is invited to respond. Results from this survey will be used to inform researchers, research sponsors and policymakers across Canada to aid in improving study design, clinic operations and research site procedures to reduce barriers to research participation and improve the experience for study participants. These results will be shared with participating sites and various knowledge translation pieces will be made available for your use. All materials have been approved by the UBC Behavioural Research Ethics Board. Please check with your site/institution regarding which approvals are required to post the survey link. We will help you to tailor the best approach for your site and support you throughout your participation. #KidsCancerPain Survey: 1 week left for parents and caregivers to contribute. Please circulate/post. Over 200 parents/caregivers have participated so far – thank you! Please continue to spread the word about the campaign & survey (which is open for until July 20). The survey link is: https://www.surveymonkey.com/r/KidsCancerPain and can be easily found by searching for #KidsCancerPain and survey. Share and retweet in your networks and over social media to help promote the survey and the resource/campaign. Contact the researchers (jennifera.parker (at) iwk.nshealth.ca) for campaign materials for distribution; click here for a survey invitation poster, campaign poster, and samples of digital campaign files can be found here and here. 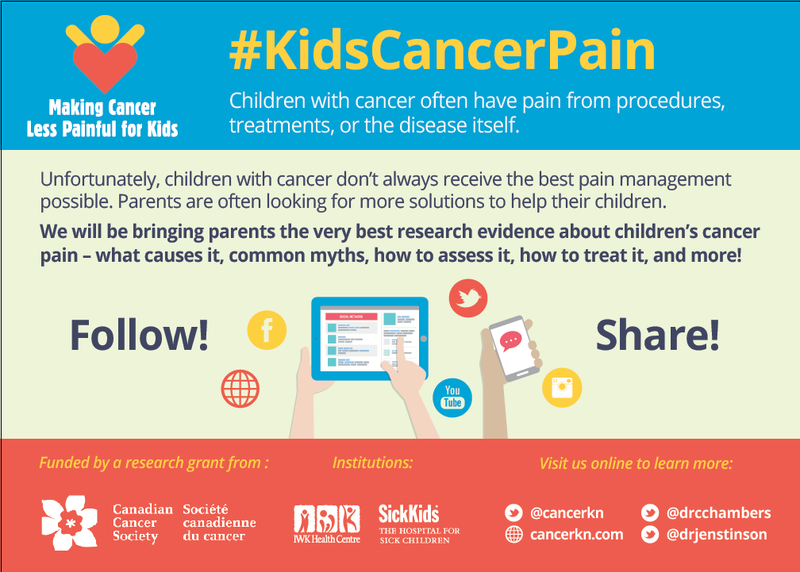 Over the next 12 months, #KidsCancerPain will be bringing parents the very best, cutting-edge research evidence about children’s cancer pain – what causes it, how to assess it, how to treat it, common myths, and more! This information will be shared with parents in a series of blogs, videos, images, Facebook posts, and Twitter chats, all posted and shared on the Cancer Knowledge Network website (https://cancerkn.com/) and social media. They will be studying the reach of the campaign and its impact on parents. You will be learning more about #KidsCancerPain, but in the meanwhile these researchers are asking you to share and promote in your networks and on social media. The major focus right now is getting as many parents/caregivers who have a child with cancer currently in treatment, remission or who is a survivor to complete the survey. The survey takes 10-15 min to complete and there is a chance to win 1 of 3 $250 Visa gift cards. This is a critical component of the evaluation of the campaign. Share and retweet in your networks and over social media to help promote the survey. Don’t forget to use the hashtag #KidsCancerPain! “Making Cancer Less Painful for Kids” campaign #KidsCancerPain – in partnership with the Cancer Knowledge Network (North America’s most widely read online cancer resource), and funded by a research grant from the Canadian Cancer Society. The work brings together a team of internationally known health researchers, clinicians, patients, and supporting organizations and builds on our successful #ItDoesntHaveToHurt initiative. Further to these tools, this month 3CTN is releasing the new “PPI Reference Tool” and introducing the “Ask Me” Ambassador PPI role. Each of these new tools are intended to provide sites with concrete ways to incorporate PPI activities locally, especially for sites that might be struggling with way to adapt PPI to their local needs or goals. The PPI Reference Tool:This new tool has been added to the PPI Toolkit for Sites and is a “Cole’s notes” walkthrough of all the steps involved in developing and implementing a PPI role on local institutional committees. This tool also acts as across reference guide between the “PPI Framework” and the 3CTN PPI Guide so that site staff can quickly navigate relevant document sections that may help with each step of implementing a PPI role. Ask Me Ambassador PPI Role: Sites that are currently in the process of their local “Ask Me” roll out may wish to add the Ask Me Ambassador role to the roll out plan. This PPI role is covered in detail as part of the new PPI Reference Tool and represents a great opportunity for sites to involve local patients that may wish to act as trial advocates or peer mentors for new patients that are considering trial participation. The 3CTN CC and LRAC continue to increase the number of tools available to sites to implement PPI activities which will allow the Network to leverage the positive impact of PPI on recruitment and other clinical trial activities. With this month’s new tools Network sites can unlock the value of PPI locally and then share their local success stories with the 3CTN CC. BCCRIN is conducting a Canadian Clinical Research Participation Survey. Clinical researchers in Canada would like to hear from patients and study volunteers about their experience with clinical trials. Any Canadian who has ever been approached to participate in a clinical trial and either declined, did not qualify or participated is invited to respond. The survey is web-based and completely anonymous. Results from this survey will be used to inform researchers, research sponsors and policymakers to aid in improving study design, clinic operations and research site procedures in order to reduce barriers to research participation and improve the experience for study participants in Canada. These results will be shared with N2 members and various knowledge translations pieces will be made available for your use. BCCRIN is seeking your help to post this survey link and the invitation where patients/public can find it. There are materials available for use on your websites, in paper or electronic mailings and social media. French translations of the materials and survey are in progress but not yet available. Materials below have been approved by the UBC Behavioural Research Ethics Board and provided your site is not actively enrolling for this survey, local REB approval may not be required. Please check with your institution regarding which approvals are required to post the survey link. Would you like to understand why families decline participation in clinical trials? Read this press release to learn more about the BCCRIN anonymous survey for patients/families who have declined or participated in clinical trials. Clinical researchers would like to learn about Canadian’s experience with clinical trials. The Canadian Clinical Trials Coordinating Centre (CCTCC) is pleased to partner with the BC Clinical Research Infrastructure Network (BCCRIN) on the national expansion of the BC Clinical Trials Participation Survey. This survey recognizes the importance of engaging and learning from patients and the public about the clinical trial process. From the BC only data, researcher have found that patients/families that decline participation in clinical trials have a very different understanding of the clinical trial process than those that participated in a clinical trial. If you have participated in a clinical trial, were asked to participate and declined, or if you are the parent of a child who has been asked or has participated, your feedback is important to the future of research in Canada. C17 addendum: please note this survey does not appear to work in older browsers.